Although you can access Mr. Mortar earlier in the game, you won't have Waterfall the first time you pass by. To conquer the inside of the mountain properly, you'll need to bring along Pokémon that use Surf, Flash, Strength, and Waterfall. An Escape Rope or a Pokémon that knows Dig will help you if you get lost. Now that you have all eight badges, you can head straight to the Indigo Plateau if you want. But first you may want to take a detour to Mt. Mortar, the network of caves north of Route 44. This area has changed a lot since Gold and Silver: the maps have been tweaked a bit, two trainers have been added, and there are a lot more items to find. 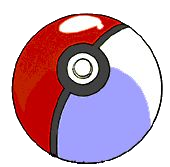 But if you already caught a Marill in Route 44, there aren't any new Pokémon to find here, except for the Tyrogue at the end. 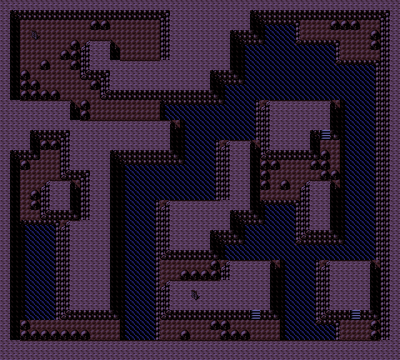 There are three entrances to this dungeon along Route 42, but the one to take is the middle. In Crystal, it's the quickest way to the Karate King, and all the best items in the second floor, and the alternate first floor, are right on the way. After you beat the Master, you can push away the rock and get all the good stuff in the basement. You'll need to bring Pokémon with Surf, Flash, and Waterfall. But heed this last warning: Take no more than five Pokémon with you. Marill is pretty tought to catch in Gold and Silver—it doesn't appear very often, and when it does, it will be on the dirt parts of the map, even though it's a Water-type. You'll probably have to wait for the swarm. A trainer named Hiker Parry way over on Route 45 is the one to talk to about that. Mt. Mortar looks intimidatingly huge, but most of it is just a big waste of time. From the entrance, you can go in to the lower cave, or down into the basement, but outside of a few easily purchased items, there's nothing on either floor. All of the good stuff is actually found on the same path. 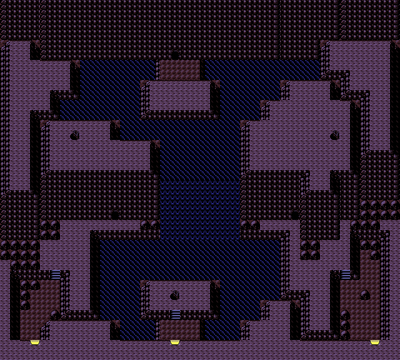 Surf north, then use Waterfall to get up to the entrance in the back of the cave. Weave your way through this tedious maze of hills and ponds, going a little out of your way to grab the Rare Candy, TM 40, and the Dragon Scale that is needed to evolve Seadra into Kingdra. 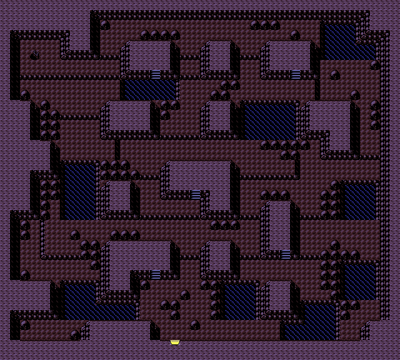 Then take the ladder in the upper left corner to a thin strip of the lower cave, where you can pick up a Max Revive (and an Iron in Crystal) and head up the ladder along the left side of the cave to the Karate King's location. Kiyo , the Blackbelt from Red/Blue/Yellow, has relocated to the depths of this mountain, but it wasn't far enough to get away from you. Take down his two fighters and he will give you a Tyrogue Pokémon, but only if you have an open slot. If your party is full then go empty a slot for Tyrogue, when you return Kiyo will then give you the Tyrogue. 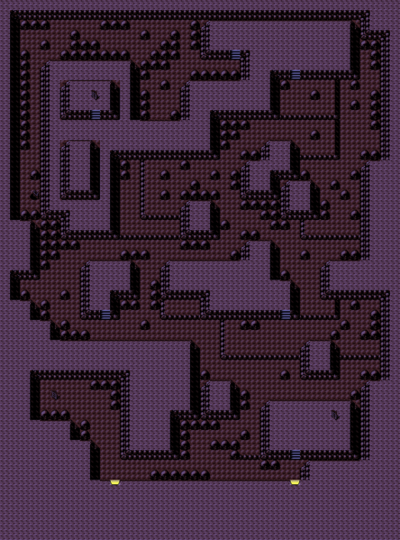 Tyrogue exists merely to evolve. It has poor stats and can learn nothing beyond Tackle. But at level 20, it will evolve into Hitmonlee (if its Attack is higher than its Defense), Hitmonchan (if its Defense is higher than its Attack), or Hitmontop (if the two stats are equal), Use Iron or Protein when Tyrogue is at level 19 to engineer the one you want. Hitmontop is new, but never learns anything good, so Hitmonlee is still the best. This page was last edited on 19 November 2018, at 00:50. This page has been accessed 375,801 times.